Our product range includes a wide range of microwave test bench, integrated circuits trainer, wave & propogation trainer, cross directional coupler, detector mount and coaxial wave guide adapter. 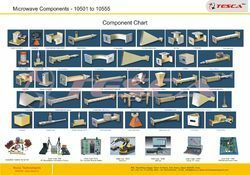 The Microwave Test Benches are precision made microwave systems, which use standard type rectangular wave-guide components to illustratethe essential elements of this field for study. Advanced Microwave Integrated Circuit Lab includes instruments and accessories for studying the characteristics of any MIC (Microwave Integrated Circuits) component over the Frequency Range 2.2 to 3GHz. Characteristics and measurements like Transmission Loss and Reflection Loss of different MIC components can be studied with the help of instruments provided with Order Code- 10411 / 10411A. Directivity and Gain of Antennas can also be measured with the setup provided. The theoretical background on these components and experimental details are provided in the learning material. Complete setup with Generator, MIC Components and Meter. Gold Plated Components and Connectors. Microwave Generator with internal AM and FM. PC to PC Data Communication. The Wave and Propagation Trainer is a useful training system for the Laboratories. It helps student to learn Wave Properties and Propagation results. Concepts of Reflection, Refraction, Polarization, Diffraction, Interference, Standing waves and Interferometer can be understood very easily. 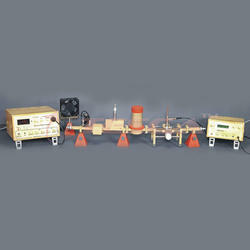 The setup mainly consists of Microwave Transmitter, Microwave Receiver, Goniometer scale. Along with this setup a number of other accessories are provided to perform different experiments. A user friendly manual is provided with this system to help student in performing the experiments and to understand the topic theoretically. 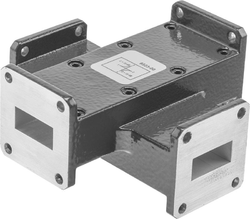 Cross Directional Coupler consists of two waveguide sectional joint at (90°) with the coupling element mounted into the common broad wall. impedance to coaxial impedance. Adopters consist of a short section of wave guide with a probe transition mounted on broad wall. Power can be transmitted in either direction. Each adapter covers the 50% of the wave guide.